​​​The key to improving acorn production in oaks begins with identifying the best acorn-producing trees where you hunt, and I shared an acorn survey technique for doing so in the first part of this two-part series. Once you have identified the best acorn producers in the stand, it’s time to conduct a timber harvest to improve acorn production (whether you cut the trees yourself or allow a logger to do the work). The efforts you have taken with your acorn survey, combined with the following guidelines, will encourage more consistent, abundant acorn crops from your oak stands — and that means better deer habitat, nutrition and hunting opportunities! Now that you have identified your best producers, the first step should be to provide those trees with growing room. Remove (or have a professional forester or logger remove) any poor producers whose crowns are touching the crowns of your marked trees. Ideally, you want competing trees removed from at least three sides of your best producers. If done correctly, your stands will need this treatment only once every 12 to 15 years; as soon as the crowns of neighboring trees start touching again, it will be time for another harvest. Work to maintain a diversity of oak species on your property. A good guideline is to manage your oak stands to be composed of one tree in the white oak family for every three in the red oak family (1:3). Red oaks are more consistent producers than white oaks, and having both groups of species in the same stand will buffer against a total crop failure if one group doesn’t produce acorns. Also, retain other mast-producing species like American beech. These trees provide your deer with another food source and buffer against poor acorn crop years. To maximize acorn production, at least half of your oak stands should be composed of trees greater than 50 years old. Work to have this age-class distributed evenly across your forested acreage. Locate younger stands directly next to 50-year-old-plus stands to provide browse and cover opportunities for your deer. Allow your best acorn producers to grow larger than 20 inches in diameter, as most oak species begin producing their largest crops at this size. Periodically thinning around these trees every 12 to 15 years will encourage good acorn production for many years.Don’t let anyone talk you into a timber harvest where all trees over a certain diameter will be harvested. Such “diameter-limit” cuts will reduce acorn production and can significantly reduce the quality and health of your oak stands. Conduct your acorn surveys prior to each timber sale to determine when a large diameter tree is no longer producing large crops consistently. Fertilize your food plots, not your forest. Don’t waste your time and money trying to fertilize oaks to increase acorn production. Although there is some competition between trees for water and nutrients, sunlight is by far the most important resource your trees need for growing large acorn crops. Acorn production is so variable from year to year, it’s difficult to prove that fertilizer is responsible for any change you observe in your acorn crop. In fact, a long-term study now underway is already revealing that fertilizer has no apparent benefit for acorn production. The same study is showing that thinning your oaks is a much more effective way to provide your trees with the resources they need to produce acorns. Take what time you had set aside for fertilizing oaks and use it to conduct the acorn survey. Much if not all the work involved in removing poor-producing oaks to give more resources to the strong producers can be done by you and your chainsaw. However, there’s a good chance you may be able to harvest a profit from the oaks you will be removing, especially with large-scale projects. That’s why the first step in any timber-harvesting operation is to consult a forestry professional to help you prepare and oversee your timber harvest. If managed correctly, your oak stands should pay for themselves and help offset the cost of other management projects on your property. Foresters use basal area as a guide to determine the correct distribution of trees needed to meet your management objectives (basal area is the cross-sectional area of a tree measured at 4½ feet above the ground). The best acorn production will be achieved in stands where basal area is between 60 and 100 square feet per acre and oaks average greater than 20 inches in diameter measured at chest height. I suggest your forester use the higher basal area because it allows you to retain a few more trees per acre; this provides insurance for those times when a tree you’ve identified as a “good producer” turns out to be not so good after all. The concept of basal area isn’t difficult, but it is best taught in the field; ask your forester to show you how to measure the basal area of your forest stands. If you follow the survey and management guidelines presented in this article you will be rewarded with improved growth and acorn production from your oaks. Additionally, the timber sale will increase sunlight into your forest and stimulate the growth of stump sprouts and oak seedlings; those not eaten by deer can be nurtured as your future oak stand. Money you generate from the timber sale can be used to pay for other habitat improvement projects, or to have your next acorn-fed buck mounted! The information for this article was originally published in QDMA’s Quality Whitetails magazine, authored by Matthew Tarr – University of New Hampshire Cooperative Extension Wildlife Specialist – and is shared here as a sample of the information QDMA members receive. To start receiving Quality Whitetails, join QDMA today. When spring rolls around, hunters everywhere gear up to begin establishing or “recharging” the mineral sites on their hunting properties. They know that deer typically begin using supplemental minerals around spring green-up and continue until early fall. Surely, the knee-deep depressions in the soil caused by repeated years of mineral supplementation are evidence of deer need, correct? Maybe, or maybe not. Growing antlers are composed mostly of proteins (80 percent by weight); whereas hardened antlers contain roughly equal amounts of proteins and minerals. Studies have shown that calcium and phosphorus are by far the two most common minerals in deer antlers, comprising 30–35 percent of the mature antler by weight. However, a University of Georgia study detected 11 different minerals in the whitetail’s antlers. In addition to calcium (19 percent) and phosphorus (10 percent), the next most common elements were magnesium (1 percent) and sodium (0.5 percent). Lesser amounts of other minerals were found including potassium, barium, iron, aluminum, zinc, strontium and manganese. Besides calcium and phosphorus, little is known about the role of other minerals in antler growth. Clearly minerals are important in antler development. Because of the large quantities of minerals required for antler growth, whitetails have developed the ability to “bank” calcium and phosphorus in their skeletons and then transfer these minerals during antler growth. However, these body sources of calcium and phosphorus provide only a portion needed for optimum antler growth. The rest must come directly from their diet while their antlers are actively growing. Therefore, mineral supplementation prior to and during antler growth may be beneficial. Minerals are also important for does. During gestation and lactation does have high requirements for calcium and magnesium. Research on domestic livestock has documented numerous benefits of mineral supplementation including increased forage intake, improved forage digestion, and increased reproductive success. In contrast, most studies on whitetails have focused on the impacts on body weight and antler development. Researchers at Mississippi State University found a strong correlation between soil mineral content (primarily phosphorus) and body size, although no correlation with adult antler size was found. They concluded that soil phosphorus levels were the best indicator of body size, probably because phosphorus deficient soils are common throughout the United States. A classic study on the mineral needs of deer was conducted at Penn State University in the 1950s. In this study, researchers did detect a difference in yearling buck antler development between supplemented and unsupplemented groups. However, these herds were fed a nutritionally deficient diet below what most whitetails would have access to in the wild. Furthermore, when the same deer were examined the following year as 2.5–year–olds, no differences were detected between the two groups. In a similar study conducted at Auburn University, researchers tried to detect differences in body and antler size between an unsupplemented and supplemented group. This study differed from the Penn State study in that both herds were fed a nutritionally complete diet. In addition, one group was provided a commercial mineral supplement. Over a four year period the researchers were unable to detect any differences between the two deer herds. Without question deer need minerals, and they will readily use mineral licks. But why do they use these licks and why is their use restricted primarily to the spring and summer? Many hunters believe that it is simply because bucks need the minerals for antler growth and does for raising fawns during these months. However, several studies have shown that while deer readily use mineral licks high in salt, they rarely, if ever, use pure mineral supplements. If deer were lacking minerals, why wouldn’t they use the pure mineral supplement even if salt wasn’t present? No one can say for sure, but it’s probably because most minerals by themselves are bitter. Could the use of salt/mineral mixes simply be due to an increased need for salt? According to research, yes. During the spring and summer, deer operate at a sodium deficiency due to the high potassium and water content of the forage. This interferes with efficient sodium conversion in the body and increases the need for sodium. This makes deer actively seek out concentrated sources of sodium such as natural or man–made licks. Research in Tennessee supports this. Type of mineral formulation affected total deer use of baited sites, with a high salt formulation receiving over four times the number of daily visits from deer as other formulations. Almost all soils more than 25–50 miles from a seacoast are low in sodium. Therefore, in these areas, salt may be just as necessary as calcium and phosphorus to whitetails during the spring and summer. There are three main types of mineral supplements. 1.Food additive – these minerals are combined with a supplemental feed, and deer get them while consuming the feed. 2.Blocks – these are commercial mineral blocks placed on the ground or on a stump, and deer get the minerals by licking the block or consuming the soil below it. Research shows blocks tend to be the least effective way for deer to get supplemental minerals. 3.Granular – these minerals are added to the soil, and deer get them by consuming the minerals and/or soil/minerals mixture. Research shows granular minerals facilitate increased consumption by animals as they’re able to literally eat (vs. lick) the mixture. There are commercial and “homemade” granular mixes available. What does all this mean to the average deer hunter and manager? The results of these studies suggest that mineral supplementation – especially calcium, phosphorus, and sodium – may provide some benefit, especially in situations where deer are nutritionally deprived or areas with minerally deficient soils. However, age and nutrition are the two most important ingredients for producing large antlered bucks. Regardless of the intensity of mineral supplementation, a yearling buck will still be a yearling buck. Bucks must live long enough to reach physical maturity while having access to high quality nutrition to achieve maximum antler growth. Creating a lick is certainly fun, inexpensive, and watching deer respond to these licks is satisfying. Mineral licks also provide a great place to survey deer with game cameras. So, if you have already addressed the larger concerns of habitat and herd management, mineral supplements can be another part of your overall management plan. The key is to have realistic expectations. Don’t expect to see trophy bucks walking around this fall just because you gave them a mineral boost this spring. While the advantages of mineral supplementation have not been clearly documented, neither have any disadvantages. Trophy size deer start with the right nutrition along with age and genetics. Old South 30 Point Deer Mineral and attractant helps the hunter get a jump start on producing that buck of a lifetime. Much trial and error along with research from some of the nation’s leading schools in deer health has enabled us to produce both a mineral that is healthy for the entire herd as well as palatable to deer. Selective vitamins and minerals have been combined with all natural flavors to produce a mineral that deer will seek out on your property. More than just salt, 30 Point Mineral is designed for total herd health. It not only helps in aiding in antler growth, but also helps deer during the stressful post season stages, increases health of lactating does, and fills in the gaps that Mother Nature leaves out at certain times of the year. 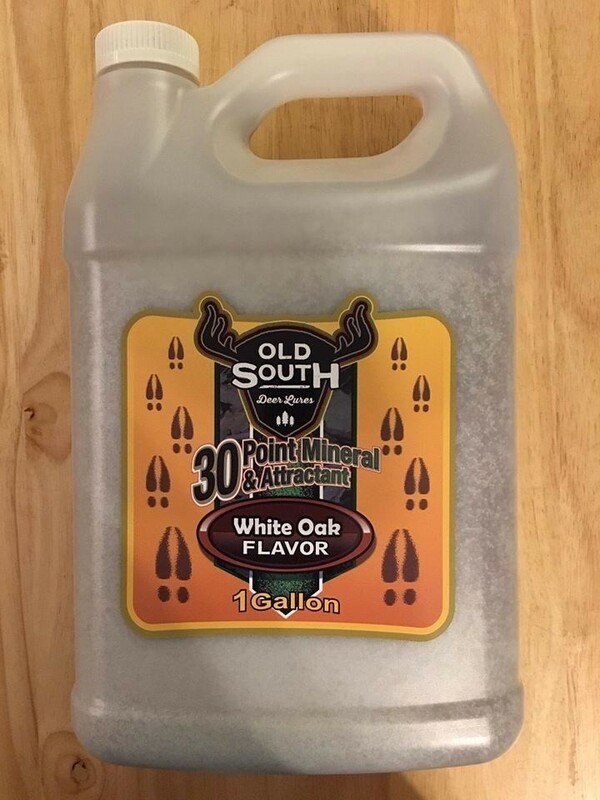 If serous deer health and antler growth is important to you as a hunter like it is to us then Old South 30 Point Mineral and Attractant is what you need. Directions for use: Place mineral in an area used by deer frequently. Pour entire jug on the ground or preferably on a stump, can also be mixed in with protein feed or fed freely in feeders.